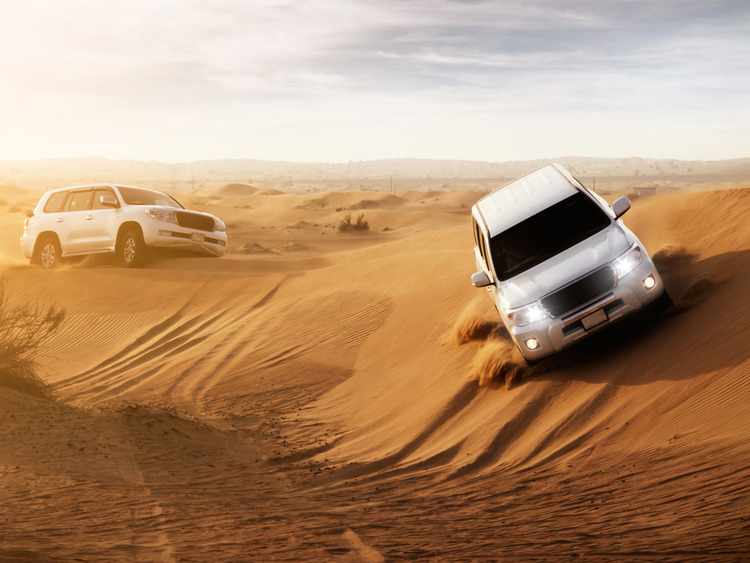 On this exciting excursion we experience the thrill of climbing up and down the peaks and troughs of sand dunes on powerful 4x4vehicles driven by desert safari experts. We stop at a Bedouin camp in the desert to savour a delicious Arab coffee accompanied by delicious dates, dried fruit and fruit juices. During our stop, we also have the opportunity to experience the excitement of a ride on camelback or to climb up and down the peaks and troughs of steep sand dunes. Please wear comfortable walking shoes (for the desert) and casual clothing. This tour does not feature a guide. Pregnant women cannot participate in the excursion.? Minors under the age of 4 cannot participate in the excursion. The capacity of each jeep is 6 people, therefore they will be shared with other guests. All guests taking part in this excursion must leave their luggage outside the cabin according to their disembarkation time (check the Diario di Bordo). Hand luggage deposit is available on board. This excursion is reserved to all the guests who will not disembark in Dubai and to disembarking guests with the flight after 6 pm from Dubai Airport. We cannot garantee the same places on the same jeeps to families. It is not possible to carry strollers inside the jeeps.